The cancellation of a massive contract awarded to a joint-venture company in which WCT Bhd participated is prompting some analysts to take a closer look at Dubai. At least three research houses issued early despatches on the emirate's super hot property sector yesterday. Although ECM Libra Investment Research, Citigroup and Aseambankers did not issue blanket warnings in their reports, they pointed out the emerging risk of a property downturn in Dubai. 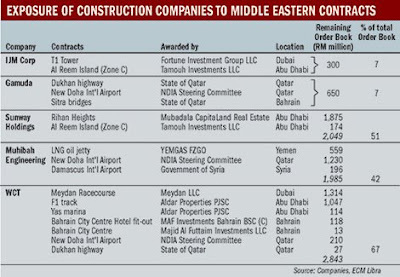 Several Malaysian companies are currently undertaking huge construction projects in Dubai. They include WCT, Gamuda Bhd, IJM Corp Bhd, Muhibbah Engineering Bhd and Sunway Holdings Bhd. On Monday, the WCT joint venture to build a RM4.6 billion racecourse was cancelled, with the principal Meydan LLC saying that the job had fallen behind schedule. WCT is contesting the cancellation. ECM Libra said it was as surprised as WCT, adding that in its engagement with the company, WCT had said that its projects in the Middle East were on schedule. While indicating that the dispute between the joint venture and Meydan could be project-specific, ECM Libra noted that the Middle East, too, was not being spared the negative impact of a global economic slowdown. "It is likely to see slower construction activities as the property sector in the region cools down," ECM Libra said. As a region, the Middle East has benefited enormously over the past few years from the unprecedented rise in crude oil prices. However, as the commodity bubble burst amid a contracting global economy, the region seems to be feeling some pain from the credit crunch as well. Citigroup, focusing its report on Gamuda, said the latter's projects in the Gulf states face low risk of cancellation as they are government-funded. However, it added that Gamuda's Gulf infrastructure projects have low profitability owing to the high prices of raw materials. Still, in view of the construction and property down-cycle risks, the medium-term earnings outlook remained unexciting, Citigroup said. Meanwhile, ECM Libra said that based on conversations with companies under its coverage, collection of progress billings was still generally on time, except in Qatar where it now takes between three and four months compared with two months previously. Aseambankers analyst Vincent Khoo's report yesterday was of a similar tone, reminding clients that Moody's Investor Services had issued last October a caution on Dubai's soaring debt of at least US$47 billion (RM165 billion) more than gross domestic product. "The cancellation of the Meydan Racecouse contract raises speculation of Dubai's weakening financial position being the real reason for the cancellation," Khoo wrote. PETALING JAYA: Daewoo Engineering & Construction Co Ltd has secured a RM665mil project from KLCC Property Holdings Bhd (KLCCP) for the latter’s mixed development project in Kuala Lumpur. KLCCP said yesterday that its unit Arena Merdu Sdn Bhd had awarded the contract to Daewoo for the construction and completion of the superstructure main contract works of the project at Lot C, which is next to the Suria KLCC mall. “The contract sum will be funded through internal reserve and external borrowings. The contract completion period is Oct 6, 2011 for the whole works,” it said. According to KLCCP’s latest annual report, the Lot C development would provide an additional 1.4 million sq ft of gross floor area, made up of retail and office space. The development was scheduled to be delivered in phases, starting from 2010. KLCCP was also scheduled to start work to develop the adjacent Lot D1, which was envisaged to be a commercial development comprising both serviced apartments and prime office space.